Flying Donkey Events presents Catrin Finch and Seckou Keita at the beautiful Abbeydale Picture House. 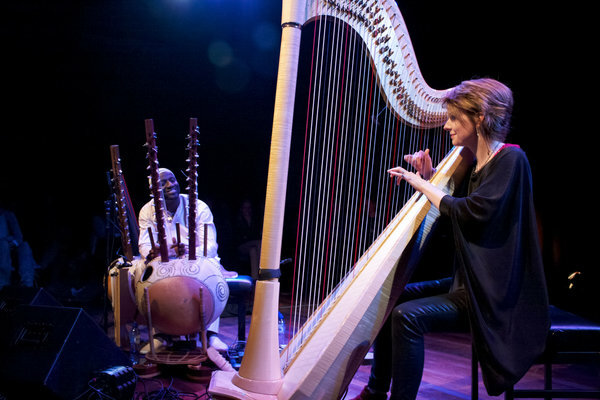 This sublime, critically acclaimed and multi award-winning collaboration between two adventurous virtuoso musicians - Welsh harpist Catrin Finch and Senegalese kora player Seckou Keita - delivers a stunning exhibition of world-class musicianship. Drawing deep on their own diverse traditions and transforming them with remarkable synergy, Catrin and Seckou have built a formidable reputation for their extraordinary performances. Following the huge success of their debut release Clychau Dibon back in 2013, their long-awaited second album SOAR launched in April 2018, followed by major UK tours in spring and autumn of 2018. The album takes flight on the wings of the osprey, the magnificent bird of prey recently returned to Wales after centuries of absence, which makes its annual 3,000-mile migration from the coasts of West Africa to the estuaries of Wales, soaring like music and dreams over man-made borders, on its innate and epic journey of endurance. Entrancing, mesmerising, intricate and ethereal, this is remarkable music and a thrilling live experience.